According to TRAI’s monthly telecom subscription report, India added 8.49 million new mobile subscribers in the month of September, nearly 3 million more than what it added in month of August. With these new additions, India now has a total of 996.66 million mobile subscribers. We are now less than 3.4 million short of magical 1 billion mobile subscriber mark. Infact, at the time of writing this, India may have already crossed the 1 billion mark as October figures are yet to be released. It would be safe to expect that October would have seen more than 3.5 million new subscriber additions. 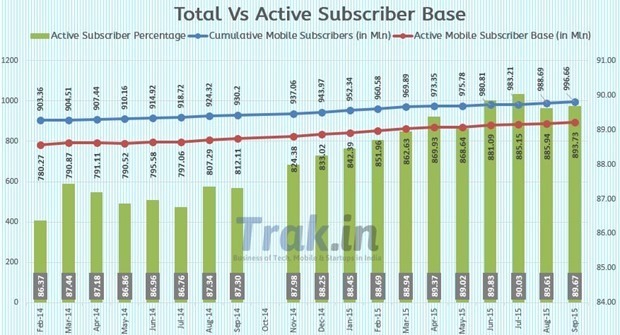 Here is how mobile subscriptions have grown over past 18 months. Interestingly, not a single month has witnessed negative growth over past 20 months. India has added close to 67 million new mobile subscribers in past 12 months alone. While total subscriber base grew by 8.49 million, active subscriber base grew by close to 7.8 million. In month of August, India registered 885.94 million active users, while in September the same number rose to 893.73 million. The active subscriber percentage grew marginally from 89.61 million to 89.67 million. If you see, the active percentage has been steadily increasing over last few months. TRAI has done well to weed out non-active subscribers from the system. In 2012-2013m, the active percentage hovered at around 75 percent. Here is a graph showing Total vs Active subscriber base growth since January 2014. – With an increase of 8.49 mln in Sept 2015, total mobile subscriber base has reached to 966.66 million. India had 988.68 million subscribers by end of August 2015. 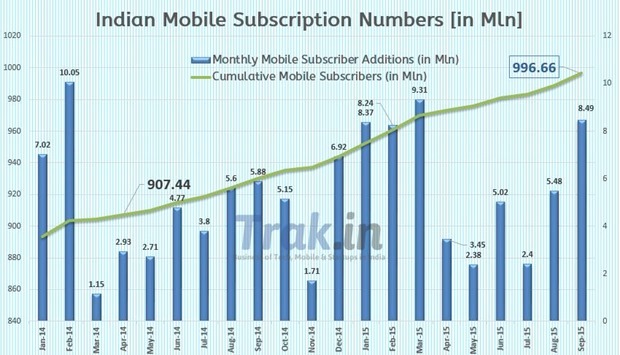 – Urban India witnessed a monthly subscription increase of 1.37 percent or 7.81 mln subscribers, while rural mobile subscriber base increased by 0.16 percent or 0.68 mln. – Urban India has a total of 577.82 million, while rural India has a total of 418.84 million mobile subscribers. – Urban Teledensity increased to 147.35 from 145.57 in August 15, while the rural tele-density increased to 48.11 from previous 48.09. – Urban mobile subscriber share stands at 57.98% as compared 42.02% of rural subscribers. – 4.17 million new Mobile portability requests were made in month of Sept 2015, taking the total tally of MNP requests since launch to 176.39 mln. – Active Mobile Subscriber base increased from 885.94 mln in Aug 2015 to 893.73 million in Sept 2015, taking the active percentage to 89.67 percent. – Out of 117.34 million broadband users, 104.28 million access internet through mobile devices or dongles. 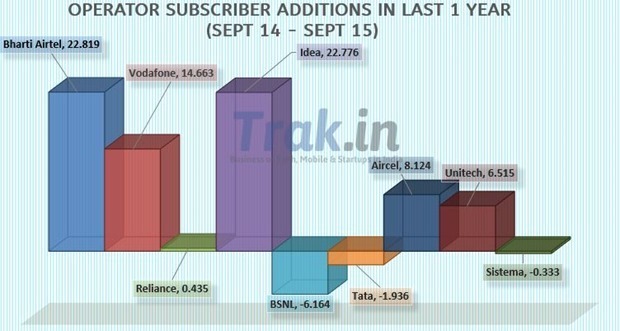 In month of September 2015, Idea Cellular added maximum number of subscribers breaking Airtel’s 3 month streak. Ideal Cellular added 2.538 million as compared to 2.228 million added by Bharti Airtel. Vodafone added 3rd highest subscribers at 1.598 million. Interestingly, BSNL for the first time in more than 2 years added in excess of 1 million subscribers in a month. Here is the graph showing Operator market share vs Monthly additions. In last 12 months, Airtel and Idea Cellular are in neck to fight with Bharti adding 22.819 million and Idea adding 22.776 million. On the other hand, 4 operators have lost subscribers, the are – BSNL, Tata, Reliance Comm and Sistema. Here is how top 8 Indian telecom operators have fared since September 2014. "India Mobile Subscriber Stats: 8.5M New, 997M Total, 894M Active, 4.2M MNP Requests [Sept 2015]", 5 out of 5 based on 1 ratings.